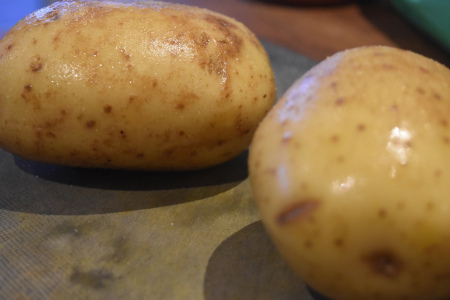 Cooking perfect baked potatoes isn't difficult provided that you start with the right potato and I go for the King Edward or Maris Piper. I'll show you how to make the right preparations, cook at 200°C on my Monolith grill and add the ultimate toppings. Crispy crunchy jackets with a creamy fluffy steaming interiors are my definitions of perfect baked potatoes and it's your choice a potato variety that determines the fluffiness. You'll hear potatoes described as either waxy or floury. Waxy potatoes are great for boiling because the firm flesh means that they hold their shape well when cooked. The flesh in a floury potato breaks down that much easier (and it's the floury varieties that we want for baking) but because we're cooking "skin on" we have the skin to maintain structure. Flavour-wise there's one more ingrediet to perfect baked potaoes and that's the barbecue. You don't have to go wild with the wood chips either. A well seasoned barbecue just adds that open fire aroma to the earthiness of the jacket, it's like another blanket of flavour around the ultimate comfort food. Before my time (way back when my Dad was a lad) you'd see baked potatoes wrapped in foil and placed directly by the coals of an open fire grill. Undercooked insides and burnt jackets, even my Dad finds it hard to be nostalgic about "silver spud rocks" compared to indirect cooking using a grill with a lid. Timings and temps vary dependent on the size of the potato. It's also fair to point out that a baked potato will cook quicker in a convection oven than it will in the barbecue so allowances need to be made - it'll take about 25% longer. Your best judge as to when your potato is done is to give it a squeeze, the skin should feel firm and crisp but then there should be plenty of "give" as you squeeze harder. Set your barbecue up for indirect cooking (for a ceramic grill like my Monolith that means heat deflector stones in situ or for a kettle it means coals to one side) and up to about 200°C (395°F). Ensure that the skins on your potatoes and washed and then prick with a fork in a number of places. This is really important for letting the steam out from inside the potato as it cooks; if the steam can't escape then your baked potato could explode! OK so maybe the mess of an exploding potato isn't so bad in a barbecue as it would be in the kitchen oven but omitting this step could mean that you have to omit your meal too! Another secret to perfect baked potatoes is to coat the skin with salt and olive oil. I find that the easiest way to do this is to pour out the salt on a board, pour the olive oil into my hand and then use my hands to coat the potato, next roll the potato in the salt and again use my hands to get an even distribution of the coating all over the potato skin. Note: there is no need to wrap in foil, this olive oil and salt is all you need to deliver a crispy, crunchy and tasty jacket. 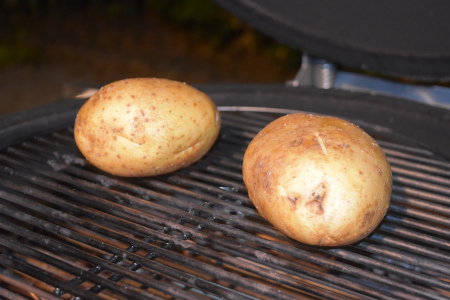 Place the potatoes in your barbecue, close the lid and cook for 60 to 75 minutes depending on the size of your potato. So you've cooked them to perfection, a crisp skin that then gives to a soft centre and now you need the perfect way to serve. You want the inner flesh of the potato to be soft and fluffy so when they are cooked, place the potatoes on a board and roll them back and forth using the palm of your hand (and a tea towel to protect you from the heat). Put some weight through your hand, you'll feel the centre of the potato soften and now it's ready to be cut into. With two purpendicular knife stokes, cut your now pefect baked potatoes into quarters, open them out and the add the topping of your choice. 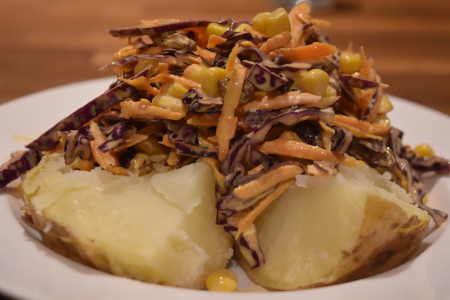 Frankly the list of toppings for a baked potato is almost endless whether it be freshly made or last night's leftovers. 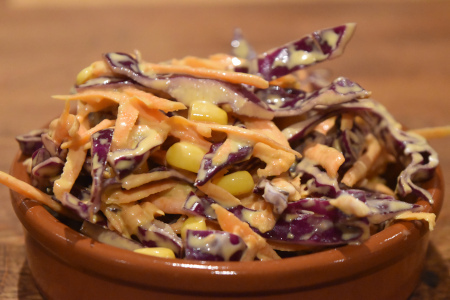 Below is my crunchy coleslaw recipe, barbecue beans work well too or if like me you prefer a potato to either rice or pasta then get stuck into any of my dutch oven recipes. 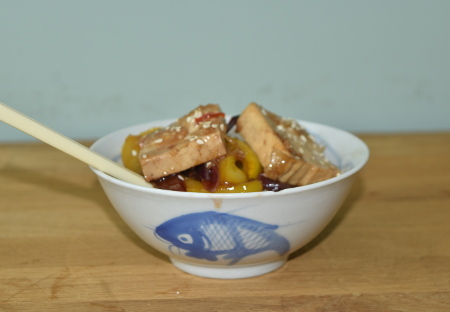 A great way to top off a baked potato and this is so easy to make. It's also surprising how much coleslaw you can make out of a quarter of a cabbage, a couple of carrots and a few optional ingredients. I also like my coleslaw to be colourful. The greater the array of colours, the more anti oxidants and so the healthier it is...oh and it looks good too. Place all the ingredients above in a large bowl and mix until all the veggies have been well coated with mayo. Add a little more mayo if needed. Alabama White BBQ Sauce (my favourite).